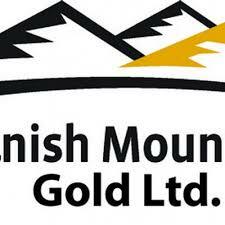 Spanish Mountain Gold Ltd. (TSX-V: SPA) is pleased to announce the assay results from its strategic 2018 drilling program for the Spanish Mountain Gold Project located in British Columbia, Canada. The highly selective program targeted areas within the high-grade, near-surface First Zone of the Project’s multi-million ounce gold resource as described in the news release dated April 10, 2017. The objective of the program is to increase the total number of gold ounces captured in a possible future mine plan by reclassifying certain Inferred Resources to the Measured & Indicated categories. By design, the 2017 Preliminary Economic Assessment only incorporated M&I resources in the mine plan and thereby treated the extracted Inferred Resources as “waste”, which had the effect of artificially inflating the Project’s strip ratio and operating cost. If the current drilling program is successful in upgrading the targeted ounces in a future resource estimate, it is expected to further improve the Project’s robust economics as it effectively converts mined “waste” into mill feed and production ounces. Significant assay results are summarized in Table 1 appended to this news release. The results of all six holes included in this first set of assays clearly indicate additional higher grade gold mineralization at shallow depths, most of which is at less than 100 metres from the surface. The holes are all located in areas that are proposed to be mined during the early years (Phase I) under the mine plan developed in the 2017 PEA. Management expects to report the remaining assay results as well as the results of the other programs over the next few months. Judy Stoeterau, P.Geo., the Company’s Vice-President of Geology and the qualified person as defined under National Instrument 43-101, has reviewed the contents of this news release. All samples were assayed at ALS Global Ltd. in Vancouver, BC. The Company has retained Discovery Consultants of Vernon, BC, to independently monitor the quality control and quality assurance (QC/QA) data on the Spanish Mountain Gold Project. Analytical precision and accuracy are being measured and monitored by the use of duplicates, prep and pulp samples and by standards (reference material). Possible contamination during the sampling and processing procedures is being monitored by the insertion of blank samples.